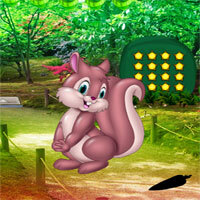 Games2Rule - G2R Funny Bunny Forest Escape is another point and click escape game developed by Games 2 Rule. In this game, you came to see the beauty of a secret funny bunny forest, which is located too far from your place. But unfortunately, you missed the way out. You have to find the way to escape from there by finding useful objects, hints and solving puzzles. Click on the objects to interact with them and solve puzzles. Good luck and have fun! btw, where's the red/yellow flower hint? hm. exchanged blue & yellow & exchanged back & suddenly it worked...?! This game does not load either here or on the G2R site itself. just get a black screen. I can watch the walkthrough but no game loads. Annoying! need sth to cut the fruits, direction hint for grid & what is this poor brown plant for (only 4 leaves)? & the coloured ♥ numbers...? There's a hot spot in scene with swans and pumpkins, for a floating plant, have you got that one? Hi Yvonne what is used for melon?? I am stuck about where Alpha is. need grid hint and 1 more orange leaf thing etc. Ah spear heads. missing 1 still. can't find one in swans pumpkin scene. stuck with 4 large orange flowers. Alpha I am stuck in same place. Thanks from me too Yvonne, I did not see those slots either. Nice game, lots of running though....thanks! In the scene with the canal at the start of the game, there is a puzzle requiring that leaves be set to certain colours. I can't seem to find any clue for this, please could someone point me in the right direction.